Classification F.C.I. N. 199: Group 5 - Spitz and primitive types; Section 7 Primitive type Hunting Dogs; without working trial. The Cirneco of Etna is a very old breed. Its origin dates back to 1000 a.C. This breed is said to descend from the Aegyptian Pharaos’ dogs from the late dynasties and from dogs imported into Italy by Phoenician traders. But later studies have shown that the Cirneco is quite likely a native Sicilian breed. During the latest centuries this breed has been applied for hunting wild rabbits. On the whole it is not common outside Italy. A medium-small sized dog of elegant and slender shape with a short coat all over the body, although he has quite thin muscles and build, he is steady and strong. 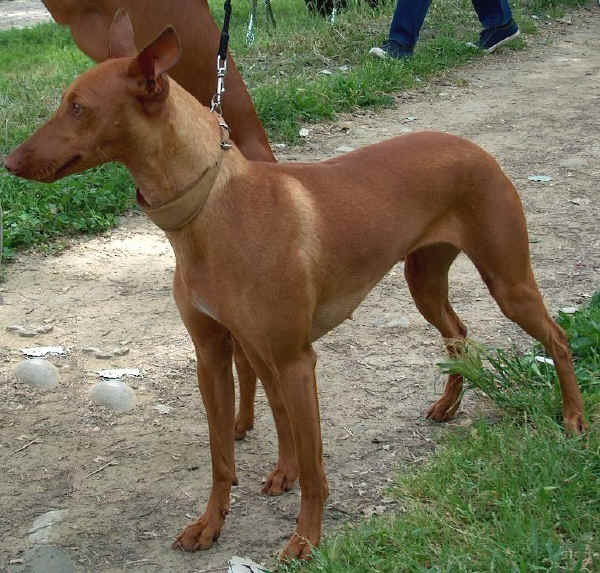 As to his temperament and built, the Cirneco cannot be considered merely as a hunting dog but also a good watchdog and a pleasant company dog. He could be classified according to these three aptitudes: gentle and affectionate, his temperament is particularly to be praised. He is a very reactive dog and can move easily on harsh and difficult land of volcanic origin. He is easily trained thanks to his temperament and his class. During hunting his highly developed smelling is best shown. 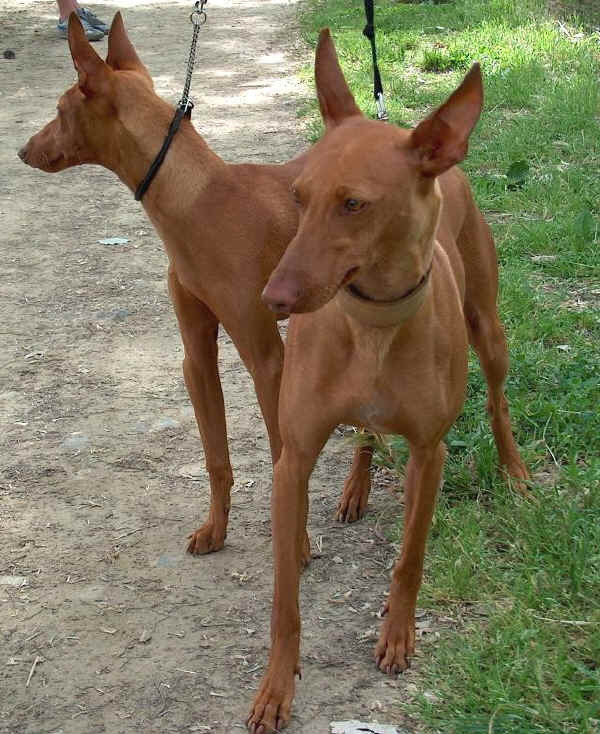 Notice: there are two similar breeds, the ‘Pharaon Hound’ and the ‘Podenco Ibicenco. Cranial region: oval shaped lengthwise, the superior axes of the skull and muzzle are slightly divergent or parallel. The upper profile of the skull is so slightly convex as to appear almost flat; the width of the skull between the zygomatic arches must not be more than half the length of the head; the superciliary arches are not very protruding; the frontal furrow is only slightly marked; the occipital crest and the occipital protuberance are only slightly developed. Stop: well accentuated, in shape of about 140° angle. Nose: quite rectangular in shape, rather large, its colour corresponding to colour of the coat (rather dark chestnut, light chestnut, flesh colour). Muzzle: the length of the muzzle is at least 80% of the length of the skull; its depth or height (measured at the middle of the muzzle) reaches at least half the length of muzzle; its width (measured at the middle of the muzzle) is less than half its length. The muzzle is therefore pointed with a straight topline of the foreface; its lower lateral profile is defined by the mandible. Lips: fine, thin and taut, only just covering the teeth of the lower jaw. The mucous membrane at the corner of the lips is hardly visible. Jaws: normally developed although do not appear strong: lower jaw lightly developed, with receding chin. Incisors, set square in the jaws, are perfectly in line and adapted. Teeth: well developed and complete, scissor bite. Eyes: the eyes, which seem rather small, are of an ochre colour, not too dark, amber or even grey, never brown or dark hazel; in lateral position; soft expression; oval shaped, with pigmentation of the eyelid rims corresponding with the colour of the nose. Ears: set quite high and close together, erect and rigid, the opening towards the front; triangular shape with narrow tip, must not be cropped. Their length is not more than half the length of the head. Profile: upper profile well arched (convex). Length: same length as the head. Shape: of similar shape to a truncated cone; the muscles are apparent, especially along the crest of the neck. Skin: fine and taut, fitting closely the sub-cutaneous; no dewlap. Topline: straight, sloping gracefully from the withers towards the rump. Whithers: raised above dorsal line, narrow because of the convergence of the shoulder-blades; joins harmoniously into the neck without any break in the line. Back: upper profile straight, with moderately developed muscles; the length of the thoracic part measures about 3 times the length of the lumbar part; the length of the loins reaches about 1/5th of the height at the withers and its width is close to its length; muscles are short and slightly visible, but firm. Rump: upper profile rather flat, obliqueness below the horizontal reaching around 45°. The length of this lean and solid sloping rlimp reaches about the third of the height at the withers, and its width is nearly half of its length; muscles of the rump are not visible. Chest: the length of chest is slightly more than half the height at the withers (about 57%) and its width (measured at the point of its largest width) is slightly less than the third of the height at the withers; the thorax reaches to, or nearly, the level of the elbow, but without going beyond that level; the ribs are only lightly sprung, but never flat; the perimeter of the chest which is more than the height of the withers by about 1/8th, determines a rather narrow chest. Underline: the lower profile corresponds with an evenly ascending line along the belly without any sudden interruption. Belly lean and tucked up, flanks of equal length to that of the renal region. Tail: low set, rather thick and equal thickness in its entire length. This tail quite long, goes down to or slightly lower than the level of the hock; carried sabre fashion when in repose, is lifted over the back, trumpet fashion, when the dog is alert; hair smooth. Straight and parallel. Seen in profile a vertical line drawn from the point of the shoulder touches the tip of the toes. Another vertical line, going from the radial-humeral articulation, divides the forearm and the carpus in two, more or less equal parts ending at half-length of the metacarpus. Seen from the front, the limb must correspond to a vertical line lowered from the point of the shoulder which divides forearm, carpus, metacarpus and foot in two, more or less, equal parts. The height of the foreleg from the ground to the elbow is slightly more than half the height at the withers. Soulder: the length of the shoulder-blade must reach about 1/3 of the height at the withers with an obliqueness below the horizontal of 55° the upper tips of the blades are close to each other; the scapulo-humeral angle measures 115° to 120°. Upperarm: its length is equal to half the length of the leg measured from ground to elbow; the arm is almost perfectly parallel or almost so to the median plane of the body, slightly oblique below the horizontal, with noticeable and distinct muscles. Foreharm: its length is equal to the third of the height at the withers; straight and parallel; the cubital-carpal groove is obvious; bone structure is light but solid. Pastern Joint: extends the straight line of the forearm; pisiform bone prominent. Pastern: its length must not be less than 1/6 of the height of the foreleg, measured from the ground to the elbow; wider than the carpus, but flat and dry, the pastern is slightly sloping from back to front; bone structure is flat and lean. Forefoot: oval shaped (hare foot) with well-knit and arched toes; nails strong and curved, brown, or flesh pink nearing brown, but never black; pads hard of the same colour as the nails. Straight and parallel. Seen in profile, a vertical line, which descends from the rear point of the pelvic tuber to the ground, or just touches the tips of the nails. Seen from behind, a vertical line drawn from the rear point of the buttock to the ground, splits in two equal parts the point of the hock, the metatarsal and the hind foot. The length of the hindlimb measures about the 93% of the height at the withers. Upper thigh: long and wide. Its length measures the third of the height at the withers: muscles are flat and the rear edge of the buttock is slightly convex, its width (outer surface) is equal to 3/4 of its length; the ileum-femoral angle measures about 115°. Lower second thigh: of slightly inferior length to that of the upper thigh, shows an obliqueness of 55° below the horizontal. The covering muscles are lean and very distinct; bone structure is light; the groove along the Achilles tendon is well marked. Stifle Joint: must be on the vertical which goes from the buttock to the ground; the tibial-femoral angle is about 120°. Hock: the distance from the sole of the foot to the point of the hock is not more than 27% of the height at the withers; its outer surface is wide; the tibial-tarsal angle is about 135°. Metatarsal: the length is equal to a third of the length of the foreleg measured from ground to elbow; of cylindrical shape and in vertical position, thus perpendicular to the ground; no dewclaws. Hindfeet: slightly more oval than the forefeet, with otherwise all the same characteristics. Skin: fine, well fitting to the underlying tissues on all parts of the body. Colour varies according to that of the coat. The mucous membranes and the skin of the nose are in the colours described for the nose and must never show black patches nor be depigmented. Texture: hair smooth on the head, on the ears and legs; semi-long (about 3 cm) but sleek and close lying on the body and the tail; hair straight and stiff like horse hair. Colour: a) self-coloured fawn, more or less intense or diluted like Isabella, sable, etc. b) fawn with more or less extensive white (white blaze an the head, white mark on the chest, white feet, white tip on tail, white belly; a white collar is less appreciated). Self-coloured white or white with orange patches is tolerated; a fawn coat with a mixture of slightly lighter and darker hairs is allowed. Faults: any departure from the foregoing points constitutes a fault which when judging must be penalised according to its seriousness and extension.